Wortschatz, Grammatik, Wendungen, sprachliche Strukturen, nicht zuletzt das Gespür für die Sprache selbst – testen Sie, inwieweit Sie ein „advanced learner“ sind. In Business Spotlight 2/18, you can test yourself to find out if you're already an advanced English learner. Below, you can do two of these exercises online. The Situation: My Home Ltd, a company that designs and produces home textiles, is planning to take over Interior Design Ltd, a company that used to be its fiercest competitor but has recently got itself into serious financial difficulties. Jackie Myers from the finance department provides some comments on the competitor’s latest figures. Which of the four options does not have the same meaning as the words in bold? 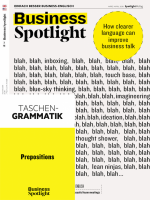 Dieser Beitrag stammt aus dem Magazin Business Spotlight 2/2018. Die gesamte Ausgabe können Sie in unserem Shop kaufen. Natürlich gibt es das Magazin auch bequem und günstig im Abo.